Monday morning started off wet with rain showers, but cleared up to sunny skies just before golfers hit the course for the Spring ISD Education Foundation's annual "Tee Up for Education" charity tournament. "The tournament has been going on for many years and brings out community leaders, Spring ISD staff and companies that do business with the district," said Spring ISD Foundation Executive Director Sandra Harper Scott. "Our goal is to raise funds for student scholarships that we give out and also for teacher grants." The golf tournament kicked off at Northgate Country Club with a shotgun start at noon. The event is a fun tradition for the Spring community and brought out more than 90 golfers for the Education Foundation's biggest fundraiser. This year's goal is $95,000. "The money that they raise provides extra funding for teachers and students that I think provides a lot of benefits and value," said Michael Darlow of Perdue Brandon Fielder Collins & Mott, LLC, shortly before teeing off. "You wouldn't be wasting your money contributing to the Foundation and let them spread that money around." When asked about his favorite part of the golf tournament each year, Darlow said the camaraderie. "I get to spend time with Superintendent Watson, visit Board members and see community members that I've met over the years, along with members of the Foundation," said Darlow. "It's good to reconnect." 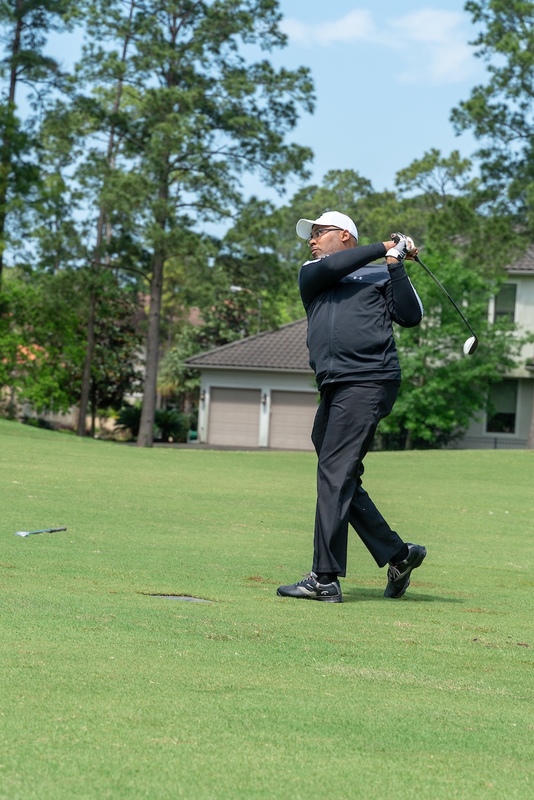 Golfers were able to take advantage of several charity initiatives along the course, including ******-in-One with a $10,000 cash prize, Longest Drive and Closest to the Pin contests, and a golf clinic courtesy of PGA professional Mancil Davis. Another highlight was the Stik-it! Fore Charity hole, a favorite from last year's tournament. After making a donation, golfers had the opportunity to use an air cannon to send the ball within striking distance of the hole. For those who considered themselves non-golfers, they were invited to join the golfers for an evening dinner with a raffle, silent auction and awards presentation. "This is an event that I look forward to every year--meeting and talking with different vendors and thanking them," said Education Foundation President Ken Grays. "The things that the Foundation does, we couldn't do without the support of our vendors and sponsors. Having the chance to get out with them on the golf course is fun." Spring ISD Board President Rhonda Newhouse, who also serves on the Foundation board, says in addition to the charity golf tournament, the Foundation raises money throughout the year for annual events including the Grant Express, Winter Wonderland literacy event, appreciation breakfast for local business leaders, and volunteer banquet. "The foundation works hard for Spring ISD to provide the district with extra funds that they don't receive from the state," Newhouse said. "There's always extra things that need to take place for the support of the students, teachers, faculty and staff. That's our job - to make it happen for Spring ISD." Normally held in October, the tournament was postponed last year and moved to the spring due to Hurricane Harvey. This year, the tournament will resume its normal date and a second tournament will be held this fall. Sponsors for Monday's Spring ISD Education Foundation Golf Tournament included: Perdue Brandon Fielder Collins & Mott, LLC, Frost Insurance Agency, H-E-B, Chick-Fil-A, Satterfield & Pontikes, Bentley & Associates, IDG, InvesTex, Stantec, PBK, TCG Advisors, Bracewell, Edgenuity Inc., Pfluger Architects, Achieve3000, Commercial Flooring, GPD Group, EnviroTurf, Josten's, and Tarkett.